The soundtrack of The Way We Were as well as Barbra’s pop album (titled The Way We Were) were both released in January 1974. Because both albums had the same title, producer Ray Stark actually sued to keep Barbra’s studio album from competing with Rastar’s soundtrack album featuring the musical score of Marvin Hamlisch, as well as two Streisand vocals of the title tune. Barbra’s album lost that legal battle and was retitled Barbra Streisand Featuring “The Way We Were” and “All In Love Is Fair”. Years later, when the remastered CD was released, the red title, The Way We Were, was restored to the cover art. The Way We Were—the studio album—was assembled mostly from unused recordings from 1970 for an album Barbra worked on titled The Singer. Only “All in Love is Fair,” “Something So Right,” the pop version of “The Way We Were,” and “Being At War With Each Other” were recorded specifically for this album in December 1973. A song called “Make the Man Love Me” by Barry Mann and Cynthia Weil, was recorded at the same December session, but remained unreleased. “I’ve Never Been A Woman Before” was by Ron Miller who also wrote “If I Could” (from Higher Ground, 1997), and the camp classic “I’ve Never Been To Me.” “Woman Before ”	was the 11 o'clock number from the musical Cherry, based on William Inge's Bus Stop. Barbra used to sing this song in her Las Vegas act. Claus Ogerman, her Vegas music director, arranged the song as recorded on this album. Martin Charnin wrote “The Best Thing You’ve Ever Done.” Charnin is most famous for his lyrics to the musical Annie. He also wrote lyrics for Harold Arlen for a while in the mid-1960's (Streisand recorded Arlen/Charnin's “That's a Fine Kind of Freedom”). Charnin told writer James Kimbrell how “The Best Thing” came to be written. “I was in New York and I ran into Herb Ross who was directing The Owl and the Pussycat at the time,” Charnin said. “He asked me if I'd be interested in writing a song for Barbra to sing in the film when the characters separate. I told him I'd like to see the roughcut of the film first, but that I was interested. I wrote the song, sent it to Barbra's people and that was it. Later, when the film was released, all the music was done by Blood, Sweat and Tears, so I thought my song was just dropped. Barbra, though, liked the song and it ended up on one of her albums three years later.” Barbra also recorded a more stripped-down version of “The Best Thing” with only a trio accompanying her (it's unreleased). Still a third version of “Best Thing” was released as a 7-inch single in 1970. Barbra first sang “My Buddy/How About Me” on her 1967 television special, The Belle of 14th Street. Mort Lindsey arranged the songs for that show. Since the Belle soundtrack was never released by Columbia Records, it's possible that Streisand wished to resurrect the medley. She recorded it fresh in 1969 with an arrangement by Peter Matz. “What Are You Doing the Rest of Your Life” was recorded during the same September 1969 session with another Matz arrangement. “Summer Me, Winter Me” is another classic Legrand/Bergman song with a gorgeous Peter Matz arrangement. Legrand wrote the melodic theme for an obscure 1969 movie called Picasso Summer. Later, the Bergmans added their exquisite lyrics. 2002: Digitally edited by Stewart Whitmore for Marcussen Mastering, Hollywood, CA. The 2002 CD is red with the Columbia Records logo; the 2002 CD has a red sticker (see right) affixed to its jewel case; Also, the 2002 remastered CD restored the original title, in red letters, to the front cover. The 2002 CD insert also included, for the first time, the “Arranged by” credits for most of the tracks. Below: The differences between the 1989 and 1994 CD releases’ cover art. Other Streisand albums which were released as Half-speed mastered LPs: Guilty, Memories, and Greatest Hits Volume 2. This Streisand album featured a striking cover photo by Steve Schapiro and a duo-toned back cover photo by David Bailey. Bailey concentrated on Streisand’s long fingernails. 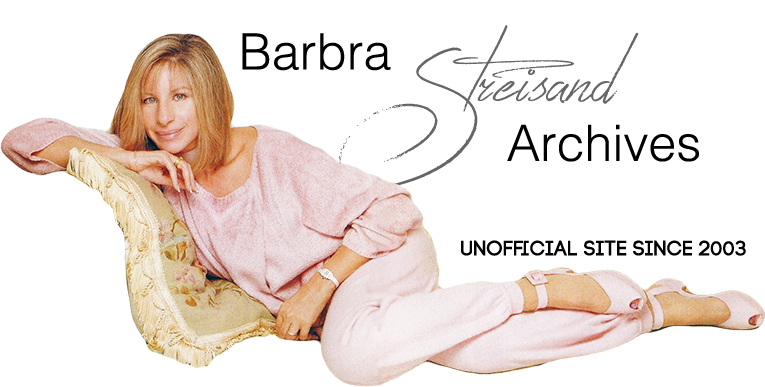 An alternate shot from the session (below) reveals that Streisand is actually smoking in the photo.